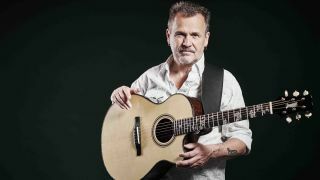 Whether he’s handling an acoustic, lap steel, banjo or electric, Martin Simpson is a master of his craft, and 20th studio album Trails & Tribulations provides yet more evidence of his learned songwriting nous. With 40 years of experience - solo and with the likes of Richard Hawley, Bonnie Raitt and Martin Taylor - to draw upon, we asked Martin to let us in on a few of his finest songwriting tips, and he was happy to oblige. Read on and take note! “Listen to the way people talk… some of the best hooks in songs are taken from the beautiful clarity and poetry of everyday speech. “Study form, listen to your favourite songs and writers, and ask yourself what they are doing that appeals to you. It’s a really good thing to recognise, that often a song is much simpler in form melodically than it might appear. “When it comes to writing melodies, don’t just use chord sequences as your building blocks. Sing lines, play lines and actually write them down. “Allow the lyrical content of the song to dictate form, rather than the other way around. I have written several songs where the words necessitate that I write in time changes, and complete melodic shifts, in order to express what I need to say. Trails & Tribulations is out on 1 September 2017 via Topic Records.